Originally called Clemmonsville, The Village of Clemmons was founded in 1802. The village is located about 10 miles southwest of Winston-Salem, and according to the 2010 census had a population of approximately 14,000. Clemmons, NC has a humid subtropical climate. The average high temperature in Clemmons during the months of June through August average no less than 86 degrees, and although this may not be common, the months of December through February all have record low temperatures approaching 0 degrees. These extreme temperature ranges make it imperative that heating and cooling systems are maintained by certified professionals. 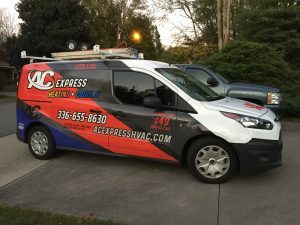 Our expert crew at AC Express Heating & Cooling LLC will make sure your heating and AC systems are properly maintained and ready for the hot summers and cold winters. Call us today for more information on our heating repair and air conditioning repair services.